“another world is struggling to be born, as always happens” ––Kazantzakis Nikos Kazantzakis (1883–1957) was one of the truly great poet/novelists of the twentieth century. Readers, critics, and scholars continue to plumb the depths and breadth of Kazantzakis’s insight into and understanding of life in all its glory and mystery. In that endeavor, Lewis Owens sheds yet more light. This is a detailed, even technical, analysis of Kazantzakis writings, based primarily upon Owen’s research at Kazantzakis’s personal library in Iraklion, Crete. Owens highlights how Kazantzakis was profoundly influenced by the “creative evolution” of Henri Bergson, and how Bergson’s creative evolution was rooted in a notion of God postulated by the mystic Jacob Boehme. 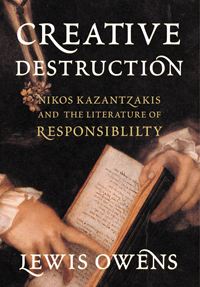 Owens rejects interpretations that label Kazantzakis a nihilist and pessimist, and claims that Kazantzakis’s political and existential thought is dominated rather by a dialectic of destruction and creation, which sees destruction as a necessary prerequisite for renewed creative activity. Kazantzakis believed that in his own time it was the individual’s responsibility to become a revolutionary communist, not because communism was a desired goal, an end in itself, but because only after communism had become a spent force could a new dawn of creativity emerge. Perhaps even Kazantzakis knew more than he, from his vantage point, could understand?